It’s “blame the algorithm” time again at Twitter. In the social media giant’s never-ending effort to purge itself of “fake news” it deleted thousands, if not millions of accounts on Tuesday night. Among our friends who were caught in the Twitter purge were former Secret Service agent, author and Fox News contributor Dan Bongino (@dbongino) and California Republican congressional candidate Aja Smith (@AjaforCongress). I’m respectful of your time & I don’t ask for help that often,but I need your help now. @Twitter is discriminating against conservative voices & banned me,& many others,from posting ads while wiping out 1000s of followers.Please follow & spread the word. Let’s get loud. This is happening to all of us. Every conservative verified account I know, including mine. 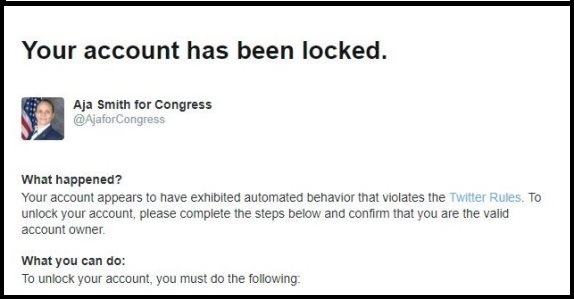 In the mean time on the west coast, Republican candidate for California’s Congressional District 41, Aja Smith (@AjaforCongress) an Air Force veteran who has been doggedly pursuing scandal-plagued Democrat Rep. Mark Takano, was locked out of her Twitter account for being, wait for it, a bot. That’s right, Twitter’s algorithm identified one of the handful of American veterans running for Congress as a potential Russian bot and locked her account. Smith’s underdog effort relies on a smart social media campaign to get her message out (you can learn more about Aja Smith here and in our article here) and to raise money, so being locked out and having thousands of followers purged was a serious blow. Cant lock us out!! We will win in 2018!! As of this writing @AjaforCongress is back online, but there’s no guarantee that as the campaign heats up Twitter won’t drop another bomb on Smith or any other conservative candidate. Our friend James O’Keefe founder of Project Veritas has a new book out “American Pravda” in which he recounts undercover interviews with, among others, current and former Twitter employees. We think it goes further than that. When a tech giant like Twitter becomes the arbiter of which candidates for Congress get a platform to raise money and communicate with voters can rule by the Silicon Valley oligarchy be far behind? Submitted by vsteele on Thu, 02/22/2018 - 17:33.
views online without censorship from twitter. Anyone censoring conservatives must be sued through FCC and Chairman Ajit Pai for favoring liberals over conservatives which violates their Constitutional rights to freely express their views as liberals onTwitter must be streamlined to give equal treatment to conservatives as liberals. Twitter must be assessable to all including, conservatives without censorship by twitter and their liberal left wing employees. Conservatives stand behind Aja Smith to win elections in her Congressional District 41 in California. and other conservatives running for elections in their respective States to have equal access to their twitter accounts unlocked to communicate with their constituents and get their message out to their voters.all conservative broadcast talk shows on television and radio including, Mr. Dan Bongino show and NRA television must have the right to buy ads equally on twitter as liberal broadcasts television and radio shows. We thank President Donald J. Trump and other Republican conservatives in Congress for draining the swamp on social media and making America great again. Submitted by jemnet on Thu, 02/22/2018 - 12:58. Well you can't fault the socialists for not having guts. "To hell with the constitution and fairness, shut down all conservative viewpoints!" The typical socialist approach is to shut up all opposing viewpoints. It's happening on college campuses and now by the socialists in control of the social media, unless we get appropriate action from Congress.